This is a new feature and is presently in Beta. We recommend first testing this feature in your test environment. 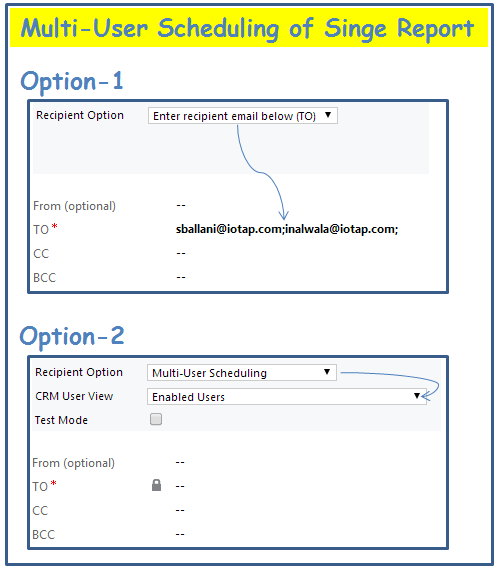 To run this feature in test mode, please tick the checkbox “Test Mode” (this field is visible in “Delivery options” section when recipient option is selected as “Multi-User Scheduling”). Please note that emails generated in “Test Mode” are never delivered to recipients and can be viewed by browsing to “Activities” from within the scheduled record”. This feature can only be used under login of CRM user having System Administrator security role. Let’s assume that you have a sales team of 25 people for whom you need to schedule the opportunities nearing closing date (on a weekly basis)and each one should receive only their records and not others. So to avoid this manual effort we have added new functionality which will allow the administrator to schedule a single view which could be sent to all the CRM users (and each CRM user will receive only records which are relevant to him/her). Option 1: Here Email recipient’s need to be manually typed in. This can even be non-CRM users. Option 2: Here the administrator can select a User View. So only the users in the view will receive the scheduled report. The difference between Option1 and Option2 is that in option1: all email recipients will receive the same report (same records) which has run under the security context of a user that scheduled this report… whereas in Option2: each CRM user will receive a different report which has been actually run under the security context of each underlying user. Question: How do I set up the CRM to automatically notify my salespeople about their opportunities (and not others) which are nearing their close date (7 days before the Established close date)? Solution: There are various approaches to achieve this and I will explain the simplest approach which is using the report scheduler multi-scheduling feature. 2. Schedule this view using report scheduler add-on with recipient option as “Multi-User Scheduling” and select the “User View” which has a filter for CRM users who need to be sent this report. Now each of the CRM User who is filtered from the “User View” selected in step2 will receive the report in email. Please note that each user will only have his/her opportunities since we selected the filter in view as (owner equals current user). This has been one of the most requested features by our customers and we are happy to let you know that this is now a part of the standard report scheduler functionality.